First Premium Jumper Foal, Empress Chin P is a farm favourite! Breathtaking to watch with her powerful and expressive ground covering gaits, Empress is exceptional and built for performance already showing us great promise as a jumper. A lovely correct type with a strong topline, beautiful head and long legs Empress is very attractive with her flashy markings. Her bloodlines combine several of the greatest show-jumping lines in Holland ensuring her destiny to excel at the highest levels of sport. The proven combination of Chin Chin x Emilion produced the 2008 National Free Jumping Vice-Champion of Holland, Annamieka VDL! Empress Chin P�s sire is the prolific show jumping stallion Chin Chin. On September 12, 2007 the extraordinary Chin Chin passed away, he was 29 years old. Empress Chin P�s dam our amazing super star mare, Pepita-S Keur has produced numerous award winning KWPN-NA TOP-FIVES offspring. 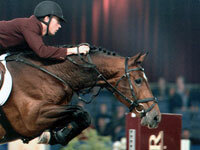 Pepita�s eldest offspring, Union S [Hold Up Premier], was ranked #7 in the TOP-TEN list for his jumping ability in 2004. In 2006, Pepita�s Indoctro yearling mare, Anime P [Indoctro], was awarded First Premium and High Score Young Horse to finish the year as the #1 Jumper Yearling in the Nation on the KWPN-NA TOP-TEN list! 2007 proved to be another tremendous year for Pepita when no less than three of her outstanding Indoctro offspring finished on the prestigious KWPN-NA TOP-FIVES list after the results from the KWPN-NA Keuring Tour were calculated. Anime P was awarded First Premium two year old, Compass P was First Premium and finished as the #4 Jumper Foal on the KWPN-NA TOP-FIVES list, Beam P was First Premium and finished as the #3 Jumper Yearling on the KWPN-NA TOP-FIVES list and Zoom P (Zarek P) 2007 North American Reserve Champion ISF Cup For 3-Year Old Jumpers. At the age of three in 2009, Beam P received the Ster and IBOP predicates and finished the year with three spots on the KWPN-NA prestigious TOP-FIVES list; 2009 North American Champion Jumper Gelding, 2009 North American Reserve Champion ISF Cup For 3-Year Old Jumpers and #3 on the TOP-FIVES list Jumper IBOP! Pepita-S�s sire the Keur KWPN stallion Emilion needs no introduction. Emilion�s Keur IBOP AA mother is a daughter of the full sister of the Holsteiner top sire Lord. Emilion's jumping index is 158 with 76% reliability. Emilion had a very successful career with many top finishes including: 1st in the World cup at Millstreet, 4th in the GP at Valkenswaard, 2nd in the GP at Donaueschingen, 5th in the GP of London, 6th in the World Pup Ahus, and with the German team he was 4th in Dublin and 2nd in Bremin. Empress Chin�s grand-dam, Haroom T, is a Ster KWPN mare by the Holsteiner stallion Larome. Prior to starting her breeding career Haroom competed successfully in both dressage and jumping. To date Haroom has produced the following offspring: Kimcorda KWPN Sport (Jumping) mare by [Concorde], Nicordo KWPN gelding by [Concorde] competing in M level dressage, Pepita-S Keur KWPN mare by [Emilion], Ramazzotti KWPN stallion by [Great Pleasure] competing in both dressage and jumping, VDL Sarantos KWPN approved stallion by [Emilion], Tarantos KWPN stallion by [Emilion], Uldrika KWPN mare by [Emilion], Vermillion KWPN stallion by [Emilion], Zummertime KWPN stallion by [Corland] and Amaretto KWPN stallion by [Corland]. Great grand-dam, Arfarnmira, is a Ster Sport (Jumping) mare who competed at the highest levels of the sport. Arfarnmira is by the prolific �Preferent� stallion G. Ramrio Z who is without question one of the most influential jumper and dressage sires in the world. G. Ramiro Z was champion of his stallion test in 1969, was awarded the title of �Horse of the Year� in 1992 and has through the success of this offspring earned the tag of �Euro-Stallion�. He sired the approved sons: Almiro, Bernstein, Dageraad, Damiro, Elmero, and Zeoliet. One of his most famous offspring is the superstar show jumper Ratina Z who won both gold and silver medals at the Barcelona Olympics as well as the Volvo World Cup and many Grand Prix victories. Raimro is also the sire of the 2004 Athens Olympic Medalist Royal Kaliber, and is grandsire to Athens Olympics super stars Montender and Butterfly Flip. G. Ramiro Z has sired hundreds more offspring competing and winning all over the world.